Is anyone experiencing an Election Day hangover? Not the booze induced kind (unless you are…no judgement, I get it.) but rather the kind that comes from nail-biting anxiety and an over-indulgence in things like chocolate, or perhaps a particularly hefty Chipotle burrito bowl. Yeah. Me too. I woke up this morning wanting to crawl back into bed. Isn’t it Friday yet? It seems like Friday. Nope. Still Wednesday. Hump day. That joke never gets old. Truth. So, let’s make something easy. Something you can make in one pot. Who wants to do dishes on a Wednesday? Not me. Let’s minimize and simplify and make something comforting, flavorful and delicious. 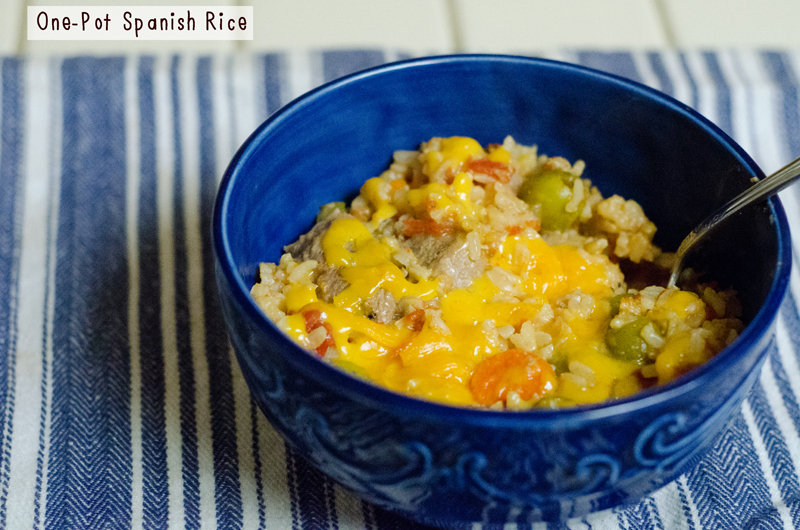 Today I bring you a One-Pot Spanish Rice. Coat the bottom of your heavy sauce pan or dutch oven with olive oil. Saute your onion and garlic over medium heat until the onion is translucent and your garlic is fragrant. Add in your stew pork. Brown it on all sides. Add salt, pepper and granulated garlic to your liking. When the pork has cooked through, add your rice. Stir. Add you wine. Add your tomatoes. Stir. Let it simmer until the wine mixture has reduced by half. Approximately 10 minutes or so. When you mixture has reduced, give your pot another stir. Add in your broth and your olives. Turn the heat down to low. Cover your pot and allow your rice to simmer for 30-40 minutes, stirring occasionally, until all of the liquid is absorbed and your rice is tender. If you feel like your liquid has been absorbed but your rice is still not cooked through, don’t panic. Add a little more broth, stir it, and allow it to cook down. 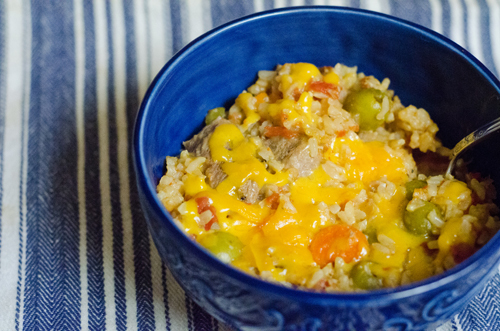 If you are using a dutch oven (as I did) because of its oblong shape, you might want to move it around while the rice simmers. 20 minutes in the middle, 10 minutes with the heat directly on the right, and 10 on the left. Play around with it. This is a forgiving dish. Feel it out. It will be a tasty result. I promise. Once your rice is tender, and your liquid is absorbed let your rice sit for five minutes. I didn’t do this. I got excited. My tongue was not happy about it. It’s a hot dish. Garnish with a little shredded cheese, and there you go! One-pot success!